Elegant and Modern 2 Bedrooms/ 2 Full Baths Apt. 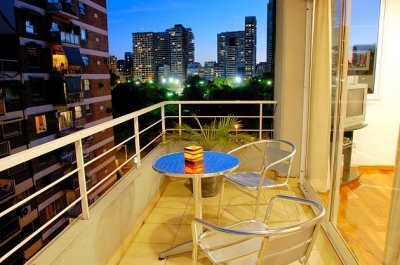 Enjoy amazing views of the Parque de las Heras and the Alto Palermo skyline from the living room, balcony and kitchen of our elegant and modern apartment located in the heart of Palermo. Surround yourself by boutiques, cafes, shopping malls, and cinemas. Eat just down the street at some of Argentina"s best restaurants, or take a short stroll to the Evita Museum, Recoleta, and the lovely parks and lakes of Palermo, where you can jog, rent a bike or roller blade without the sounds of the city. You"re also within walking distance of the incredible zoo, Botanical Gardens, the Rosedal (infinite number of rose bush varietals,) the Hipodromo (horse races,) the Campo Argentino de Polo (polo fields,) and Buenos Aires best museums: the MALBA and the Museo Nacional de Bellas Artes. Welcome to Argentina"s original and most elegant section of the Palermo District. We invite you to enjoy what Palermo has to offer from our beautiful apartment. Furnished by Maria Florencia, the owner's Argentinean wife, as our personal residence, the apartment exudes warmth and style. Entertain guests or enjoy a quiet meal in the open lay out of this modern apartment. The kitchen displays gorgeous granite countertops giving way to the elegant and comfortable living room. The built-in gas stove, dishwasher, and fully supplied kitchen, paired with the view, makes staying in almost as much fun as going out. bedrooms and the living room. Nevertheless, there is air-conditioning in each room when it"s time to sleep or relax in front of the television. The leather sofa also folds out to a bed, if a friend or family member is visiting. The apartment was built and furnished combining the comfort of one's personal residence and the luxuries of a hotel. Unwind in the Jacuzzi tub after a day of shopping in the trendy Palermo Soho, a five-minute taxi ride away. Each bedroom has a queen-size bed and both bathrooms have tub and shower. The building offers a pool, free laundry machines, and shared barbeque area on the top floor with another incredible view. In the complex, sip on a cafe con leche at the stylish cafe or indulge yourself in tango or guitar lessons at the Club Social Alvear. There are two elevators and security. We also want you to enjoy all the modern technical conveniences of home. The apartment has high-speed internet, an IP phone which enables you to call and receive calls from the states and Canada for free, a GSM cell phone, a local phone with free calls, a flat-screen television with 80 cable channels, and a dvd player and surround-sound stereo.